Note: Even if you upgrade before the trial has ended, the first subscription payment is collected immediately. The Pro and Pro Plus plans start with a 14-day trial period. Once the trial ends, you'll need to upgrade to keep using your store. 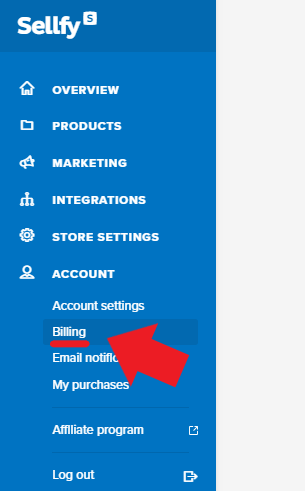 In your account, navigate to Account → Billing and press Activate subscription. On the Pricing page (make sure you're logged in). If you're already a subscribed user and want to upgrade to a more advanced plan, navigate to Store Settings → Billing in your Sellfy account and press All plans to choose another plan. Note: The new plan will be enabled immediately, but your payment schedule (billing cycle) will remain the same. For example, if your invoice typically comes on the 10th of every month, it stays the same. Sum transaction fee (for all the orders you had from the beginning of the current billing cycle to the new upgrade day). Plus, you'll also receive a refund for the unused days that remained in your previous plan. Transaction fee for orders from October 15 - November 2. Important note: If you joined Sellfy before September 27, 2017 and you're currently using the Professional plan ($15 or $9 (discounted offer) monthly) or the Legacy plan and decide to upgrade, it won't be possible to switch back to these discontinued plans. You may only choose from the current Pricing plans as presented on our Pricing page. Note: The new plan will be enabled only when the new billing cycle starts. Here's an example: you are using the Pro Plus plan since October 20 and you decide to downgrade on November 10. You'll be using the Pro Plus plan until November 20 because that's when your billing cycle re-starts. Your account will be downgraded to Pro on November 20. Check if your card and/or PayPal account have enough balance to pay the subscription cost. Make sure your card is set up for recurring payments and that it's not put on a temporary hold. Only your bank can help with these issues, so please reach out to your bank for help. Important note: If you're already using the Sell Downloads app on Wix and want to upgrade to Pro or Pro Plus on Sellfy.com with the same account, please cancel the app subscription first. Using the two together is problematic because the app will override all Pro features. Important note: The subscription will not be closed immediately, it will continue until the end of the running billing cycle. So, for example, if your billing cycle is set to renew on September 10, but you cancel on September 1, the subscription will remain active until September 10. And, the last invoice will be collected on the last day of the subscription, to collect the transaction fees. The Sell Downloads app on Wix.com is incompatible with the Pro and Pro Plus plans on Sellfy.com. You can use either one or the other, but not both in one account. Important note: If you want to switch from using the Sell Downloads app on Wix to the Pro or Pro Plus plan, please, make sure to cancel your subscription to the Sell Downloads app first, and then contact our support team to disconnect the app from your account.